Time to wrap up another month. I always find March a boring time. Spring creeps in so quietly we hardly notice it. The temperatures are in the 40's now, instead of the 30's. There was more sunshine this month than in most Marches I can remember, which was nice, less snow, at least in Detroit. It's nice to go out to get the mail without getting a blast of frigid air, especially since the screen is on the front door. The first song sparrows of the season were pecking around the patio the other morning. I think they probably do hang around our neighborhood during the summer, because I've heard them singing, but they don't visit the feeder. I got the shingles again, about a week ago, which was disappointing. However, the advantages of having a working immune system are clear. I never got any blisters, and now that I am on the antiviral (a somewhat reduced dose) they are going away quickly. I did have a very sore head for a few days. Speaking of my head, my hair is coming in nicely. It's not thick enough to take off my hat in public yet, but in a couple of weeks (by Easter, I hope), I'll be able to go hatless. There is enough growing now that the shine is gone from my scalp, but you can still see scalp. You can also see how it grows, counterclockwise from the top of my head, and around the edges it grows flat to my head. You can also see that most of the white hairs are right around my face. April is shaping up to be a busy month. My hundred day checkup is scheduled for April 26, and they want a slew of tests beforehand. I also have to start packing, and that isn't going to be fun at all. On the other hand, my long wait will be just about over. Six weeks, more or less, and I'll be in Copper Harbor. I won't be in Rainbow's End yet, but I'll be a lot closer. I hung the "Spring" bellpull today, in honor of the occasion, and it's the most exciting thing that's happened around here in some time. The weather for the past few days has been quite spring-like for March, with temperatures in the 40's and lots of sunshine. There were some high clouds today, but that didn't keep the sun from shining into the sewing room. I've been seeing the green from the grape hyacinths and Star-of-Bethlehems at the back of the rose bed for some time - they start early - and today I noticed that some green is showing in the grass. The sun is rising earlier every day - 6:30 now. Of course, there was still a little snow on the ground in the shade this morning, but that should be gone by now. It's time, I guess, but we may see some more snow at the end of the week. What I appreciate most about this time of year is the way the days get so much longer so fast. The cold and snow of winter don't bother me a lot - never did after I started driving 4WD vehicles - and even the clouds aren't so bad. It's the short days that really get to me after a while. That may seem strange for an amateur astronomer, but with the weather in these parts, there isn't much astronomy to be had in the winter anyway. Not that it's possible to see anything in the city. I'm looking forward to being in Copper Harbor for so many reasons, and one of them is that during the seasons I'll be there, there should be a lot of clear skies at night. Astronomy is problematical in the early summer, because the days are so extremely long, but from about July 20 onward, there is a reasonable amount of darkness, and from then through the beginning of October is usually when the weather is best. I know last year I saw a couple of northern lights displays that were fantastic. In September I watched the winter stars rising out the windows of my motel room all night long. It may be a little more frustrating now that I'll be on the sunset side and won't have a clear northern horizon, but I'm sure I'll find plenty to look at. I got in the habit of peering out the windows every time I got up in the night, and if I could see a star, I'd put my glasses on and take a good look. I imagine that will become a constant thing. If the northern lights are really bright, I can always get dressed and walk over to Pebble Beach. So nothing but the planning is going on, but in about two months, I should be there. What a thing to dream about! I finally took the laptop downstairs and scanned in some of the January pictures of Rainbow's End (inside and outside), and they are now in the gallery. I completed the fourth bird this week, so I took a picture of that, too. 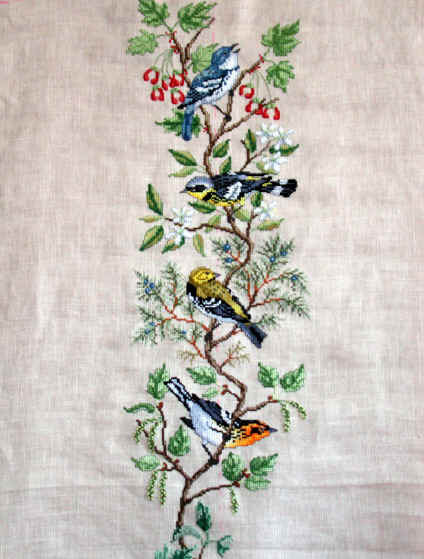 This is a work in progress, since the entire hanging has nine birds. The completed part represents 11 weeks of work. I only stitch a couple of hours a day, and of course, in December and January, sometimes I didn't stitch at all. I do embroider slowly, but this is definitely a major project, and after I've finished this one, there is a second bird hanging to go. They will look very nice in the great room. Today is one of those days in March that makes me think maybe spring is really coming: sunny, pretty, and temps in the 40s. Not this year, I think. There is cold rain or maybe sleet predicted for tonight and most of the week. Beside the garage, where the sun doesn't hit at this time of year, there is still a thin layer of snow on the ground. However, when I got up this morning (rather late), the sun was shining over the roof of the house next door and onto the hall floor. So one of these days, it will be spring indeed. In the meantime, the way this winter has gone, we could have another blizzard. Even when I hang the spring bellpull (on March 20), I'm never sure the cold and snow are over. It's snowing in Keweenaw, as usual. I am glad to see the seasons changing at a normal time, though. Thinking back, the years I remember with the perfectly awful summers are the ones when it got very warm very early - like the summer of '88 when it was 105º in Copper Harbor on the Fourth of July, and the air conditioner in the truck quit on the way home... There are some weather incidents I just won't ever forget. Spring came in March that year, and it just kept getting hotter. I had the laptop in the basement because I spent the afternoon and evening washing. It seemed like I was running out of underwear and polar fleece pullovers, and the chute was full halfway up the first floor, but when I sorted things out, it wasn't as bad as I thought. A lot of sheets and towels had gotten thrown down. I haven't done those yet, since there isn't much urgency. It's nearly as dark in the north corner of my bedroom as it is in the basement, so what I really should be doing this afternoon is making pillowcases. The first one is under test on my bed, and it seems to be working fine, so I have really no excuse not to finish the other eleven. Besides, it's warm and sunny in the sewing room on days like today. But still, I moved the thread book to the laptop and I'm updating the tables--with no help from Microsoft, it turns out. When they fixed a problem with the last release of Publisher, they accidentally broke a function I use all the time in the thread book, so in order to enlarge my tables, I'm having to copy all the data back and forth to Excel and make the changes there. Thank heaven for 700mh! It would take forever on the old computer. But even with the difficulties, that's more fun than pillowcases. So we'll see. Somehow, February always seems to me to be the longest month of the year. I guess it has something to do with the usual weather around here, dull and gray and cold but not usually snowy. For some reason, our interesting snows seem to come in December, January, or March. I can remember memorable blizzards in all those months, but never in February. Considering the February just past in Keweenaw, it's rather strange that only 600 miles south it should be so different. We had a couple of all-night rains that, if they had been snow, would have been humdingers, but no such luck. I didn't mention that last Sunday morning there was some excitement in our neighborhood which I suppose most people missed because it happened around 1:30 am. I woke up to hear a popping noise, like small firecrackers, and when I looked out the back door, I could see bluish flashes of light to the side or front of a house about a block away on Chalfonte. At the time, I thought a wire must have come down. A few minutes later, smoke started billowing up from the same place, and I thought I heard the sound of a diesel engine. I did see flashing red lights reflected in the smoke, as well as yellow like flames, and I could smell the wonderful smell of burning house. A while after that, another fire truck arrived, but he used his horn and siren at the corner of Moross. I didn't report it Sunday, because I had no idea what had happened. I knew which house it was because Burton Brothers (the local fire repair company) was there at about 8 am, but though I went by it twice and could see something like smoke damage in the front hall, there wasn't anything to see outside, like wires. So I waited until I got the Grosse Pointe News, which said that the fire started "in the vicinity of the fuse box in the basement". That must have been the arcing I saw, in which case, it must have been a total melt-down of the fuse box! Nobody was hurt, but the house was quite badly damaged, both from the fire and from the smoke and water. If they still had a fuse box, It doesn't surprise me that they had a problem. That house was probably built in the late '40s(it was there when we moved in in '49), and although a "family room" was added on the back, if it still had fuses, it had the original wiring. Pays to do some remodeling occasionally, I guess, and bring things like the electrical up to code. One of the most interesting parts of the incident to me, though, was that the first fire engine arrived without using any audible warnings, and the second engine only used their horn and siren at the intersection. One of the nice things about living in Grosse Pointe Farms, I guess, is that the Public Safety people are very considerate of the residents' peace and quiet, and only in a dire emergency would a fire engine sound its siren at 2am. Now, across the street (in Detroit), I hear fire engines, police, ambulances, and who knows what, at all hours of the night. I have never understood why the ambulances have to come screaming down the street to St. John's at 3 in the morning. I know, because I've been there, that you could shoot a cannon down Mack or Moross at those times and never hit a thing. One of the nice features of my new double-hung windows is that they are so sound-proof that I don't hear so much of that anymore. I think I'm going to like the new car a lot. If anything, it's quieter inside and has a better ride than the old one. They did some nice things with the interior, including a console that connects to the dashboard (now, how am I going to crawl over that?) and bigger cup holders. They finally put a door lock button back by the lift gate (which I already like better than the panel doors), but there is no remote to open only the lift gate. Weird. So I guess if you're paranoid, you unlock all the doors, open the lift gate, and immediately lock the doors from the switch (or something). Down here in the big city, it's probably not a bad idea to do that. I took a picture of it. You can't really see what a pretty color it is (indigo blue, not really navy), because the sun wasn't shining in the right direction. Anyway, I feel better in a blue car, and the interior is gray with a little tan in it. Much nicer than that really brown tan. As I look at the picture of the car, I realize it's going to take me some doing to really be able to handle the new camera. I clearly have some problems framing my shots. I prefer to use the LCD monitor because it shows what the lens actually sees, but it's kind of small, and when the sun shines on it, it fades out some. What's nice about the digital camera is that I'm not wasting any film (or money) learning to use it. I can take all the pictures I want, and after I've looked at them and dissected them, I can erase them all and take some more. I saw the doctor Tuesday, and he says there isn't anything wrong with me anymore. My hemoglobin persists in being slightly low, but it doesn't seem to be bothering me or him. The five o'clock shadow is now about 2mm long, so slowly the hair will grow. I had to shave my moustache again. I'm getting tired of hats. Now that I have hair, the ones that fit all twist clockwise as I move, so my nice bows in back end up around my left ear. Between keeping my head covered and the hair trying to push through the skin, my head itches a lot, and a couple of times the little hairs have apparently gotten caught in the fabric and made my scalp sore. As I've said several times before, the big things I can handle. It's the little things that bug me.